We can come to you with all the ceramic equipment OR your party can come to us to our Studio location. 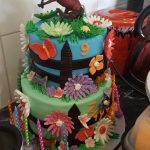 We offer fun, easy and creative birthday parties. We are happy to come to your local Darwin party address to provide a stress free creative unforgettable painting party event. Our studio provides the teacher, the pieces the customer has pre selected prior for the party, brushes, paints and ceramic sealer. Everything is supplied to complete the ceramic piece allowing the piece to be taken home from the party the same day. Have you ever been to a childs party where the children are quite, I have! The party goers sit and work quietly away on their pieces for up to 2 hours with friendly, encouraging chit chat between the attendees the kids. It really is fun to watch the kids concentrate on their ceramic pieces surrounded by their friends all enjoying a relaxed party atmosphere. 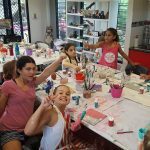 Our party decorated studio address is available for kids ceramic parties for up to two and a half hours. Cost is $24 at your address minimum 5 guests, the birthday child is free!